Rensselaer County is a county in the U.S. state of New York. As of the 2010 census, the population was 159,429. Its name is in honor of the family of Kiliaen van Rensselaer, the original Dutch owner of the land in the area. Its county seat is Troy. It is part of the Albany-Schenectady-Troy Metropolitan Statistical Area. The area that is now Rensselaer County was originally inhabited by the Mohican Indian tribe until it was bought by the Dutch jeweler and merchant Kiliaen van Rensselaer in 1630 and incorporated in his patroonship Rensselaerswyck (which, in turn, was part of the Dutch colony New Netherland). The land passed into English hands in 1664 until the Dutch regained control for a year in 1673, but the English took it back in 1674. Until 1776, the year of American independence, it was under English or British control. However, the county didn't actually exist as a legal entity until 1791 when it was created from land that was originally part of Albany County. In 1807, in a county re-organization, the rural sections of Troy were set off as towns, and the city itself was incorporated. The two towns created were Brunswick and Grafton, both named after British dukes, (the Duke of Brunswick and Duke of Grafton). A third town, Philipstown, was set off in 1806, but renamed in 1808 to Nassau after the Duke of Nassau. 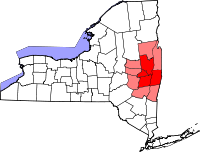 Rensselaer County is in the eastern part of New York State. 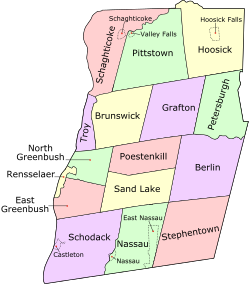 The eastern boundary of Rensselaer County runs along the New York-Vermont and New York-Massachusetts borders. According to the U.S. Census Bureau, the county has a total area of 665 square miles (1,723 km²), of which 654 square miles (1,694 km²) is land and 11 square miles (30 km²) (1.72%) is water. The terrain runs from level and flat near the Hudson and then rises into the Rensselaer Plateau around Poestenkill and Sand Lake, then to the Taconic Mountains along the Massachusetts state line. The highest point is Berlin Mountain, 2,818 feet (859 m) above sea level, in the town of Berlin. The lowest point is sea level at the Hudson. The Hoosic River, a tributary of the Hudson River, is in the north part of the county. As of the census of 2000, there were 152,538 people, 59,894 households, and 39,050 families residing in the county. The population density was 233 people per square mile (90/km²). There were 66,120 housing units at an average density of 101 per square mile (39/km²). The racial makeup of the county was 91.13% White, 4.69% Black or African American, 0.23% Native American, 1.71% Asian, 0.02% Pacific Islander, 0.89% from other races, and 1.34% from two or more races. 2.11% of the population were Hispanic or Latino of any race. 22.3% were of Irish, 14.7% Italian, 12.8% German, 7.5% English, 6.2% French and 5.3% American ancestry according to Census 2000. 93.4% spoke English and 2.0% Spanish as their first language. There were 59,894 households out of which 31.30% had children under the age of 18 living with them, 48.80% were married couples living together, 12.00% had a female householder with no husband present, and 34.80% were non-families. 27.90% of all households were made up of individuals and 10.30% had someone living alone who was 65 years of age or older. The average household size was 2.46 and the average family size was 3.02. In the county the population was spread out with 24.20% under the age of 18, 10.10% from 18 to 24, 29.10% from 25 to 44, 23.00% from 45 to 64, and 13.60% who were 65 years of age or older. The median age was 37 years. For every 100 females there were 95.90 males. For every 100 females age 18 and over, there were 93.70 males. The median income for a household in the county was $42,905, and the median income for a family was $52,864. Males had a median income of $36,666 versus $28,153 for females. The per capita income for the county was $21,095. About 6.70% of families and 9.50% of the population were below the poverty line, including 11.90% of those under age 18 and 6.60% of those age 65 or over. Beginning in 1791 Rensselaer County was governed by a Board of Supervisors, which acted as the Legislature, with the chairman of the board serving as a de-facto Executive. The county is serviced by 16 school districts. Some are completely contained in the county while some cross county lines into other counties. No school districts cross either the Vermont or Massachusetts state borders. Below is a table that shows the districts within the county, which BOCES they belong to, and which other counties they may serve. ^ The Kingdom of England existed until the Acts of Union 1707, when Scotland and England (including Wales) came together to form the Kingdom of Great Britain. ^ Rensselaer County School Districts. Capital District Regional Planning Commission. Retrieved 14 October 2008. ^ Questar III Component School Districts. Questar III. Retrieved 14 October 2008. ^ Washington-Saratoga-Warren-Hamilton-Essex BOCES Component Districts. Washington-Saratoga-Warren-Hamilton-Essex BOCES. Retrieved 14 October 2008. Note: Linked titles redirect to a free, full-view version hosted by Google Books or the Internet Archive. Anderson, George Baker (1897). Landmarks of Rensselaer County New York. Syracuse, New York: D. Mason and Company. OCLC 1728151. http://www.archive.org/stream/landmarksofrenss00ande#page/n5/mode/2up. Weise, Arthur James (1880). History of the Seventeen Towns of Rensselaer County from the Colonization of the Manor of Rensselaerwyck to the Present Time. Troy, New York: J. M. Francis & Tucker. OCLC 6637788. http://www.archive.org/stream/cu31924064123015#page/n5/mode/2up. This page uses content from the English language Wikipedia. The original content was at Rensselaer County, New York. The list of authors can be seen in the page history. As with this Familypedia wiki, the content of Wikipedia is available under the Creative Commons License.